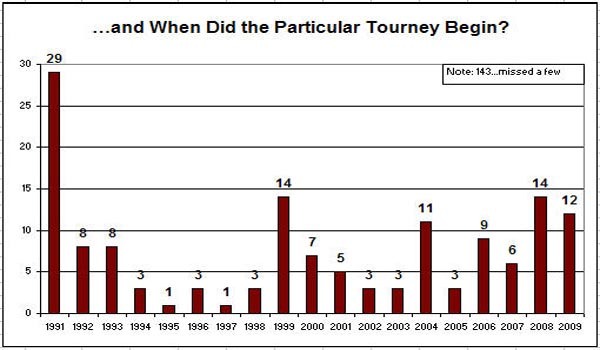 Tournaments run or fall out of the World Boardgaming Championships based on participation of attendees. What's hot one year sometimes disappears the next year, which generates a level of tension for adherents of particular genres. 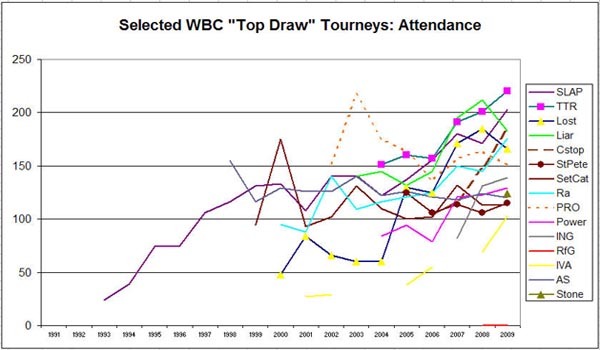 As attendance increases and the types of players who attend shifts over time, there is concern: "Will the games I like to play disappear from WBC?" Despite that fear, the tournaments available at the convention has continued to show diversity, with a majority of the change taking place in 1999, with the changeover from Avaloncon to WBC and the addition of non-Avalon Hill games to the schedule. 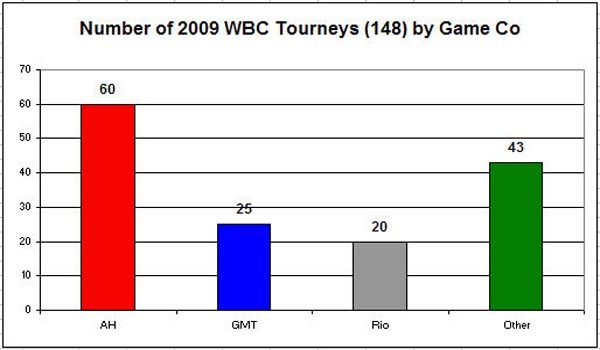 WBC's tournaments consist primarily of strategy games, but this doesn't necessarily mean "monster" or "complex", as many of those types of games are not suited to a tournament format. 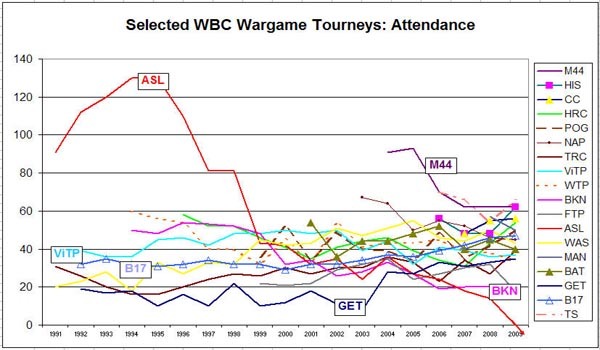 Thus, when it comes to Game Weight ("how difficult the game is to play", as defined by BoardgameGeek.com), most WBC tournament games fall in the middle, with many of the outlyers dropping off the schedule, including Advanced Squad Leader and Die Macher at the top end and Greed at the bottom end. Still, complex games such as A World At War have continued to thrive, with three times as many players (24) participating as in 1992 (when the tournament used Advanced Third Reich). 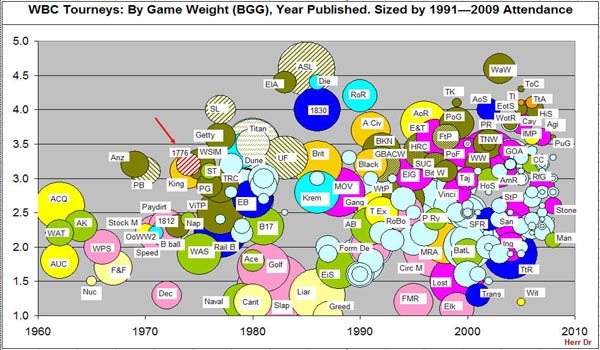 Very light games, suited for late-night play, such as Elchfest, Slapshot, Liar's Dice, and Can't Stop continue to garner large crowds, but they don't dominate the schedule at other timeslots. What does this all mean? 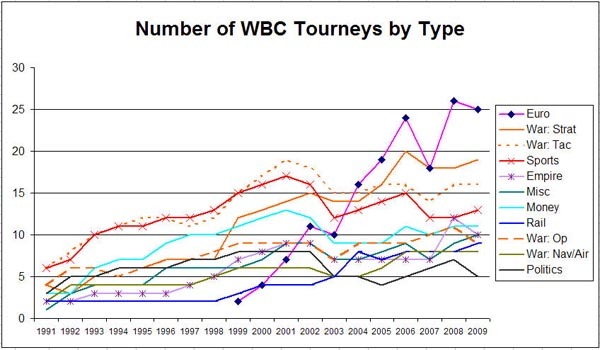 The numbers boil down to the fact that WBC is a convention that does justice to several different genres within the hobby. Nobody needs to worry that the convention is becoming all wargames or all Eurogames or too much of anything else. There is a solid mix. Anybody who plays boardgames will be able to find something to suit his or her tastes for many years to come. Good gaming, and I look forward to facing you across the table in Lancaster! Last updated 6/24/10 by kae.